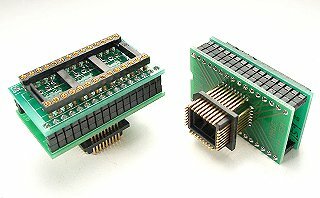 PLCC emulator adapter for 27x64, 27x128, 27x256, 27x512 devices. DIP socket to PLCC plug. Top Side; Pins: 28 Pitch: 0.100"
Bottom Side; Pins: 32 Pitch: 0.050"